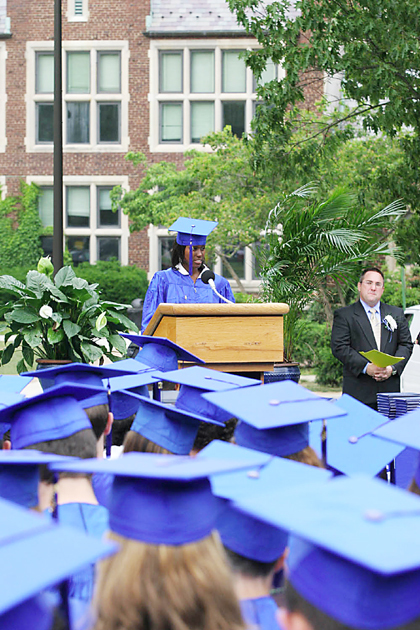 CLASS OF 2005: Senior Class President Sasha Jean addresses her fellow classmates at Princeton High School's 76th graduation ceremony, held on Thursday, June 16. Under clouds threatening rain, students reflected on their senior year, and the road that lies ahead. Pictured to the right of Ms. Jean is PHS Principal Gary Snyder. From construction, to lawsuits, to a series of events involving Trenton-based gangs, students at Princeton High School had an interesting senior year in 2005. One thing students can agree on is that it was memorable. Last month, when Borough Council held off introducing an ordinance that would allow additional development rights in the University's Engineering Quadrangle, it was because some Council members felt there were unanswered questions in the original proposal, including the school's use of a jitney, and tree buffers along the Murray Place end of the zone. Just one day after Princeton Township Committee unanimously created a resolution declaring opposition to a proposal to build a rail-to-truck facility off Route 206 in Hillsborough, Princeton Borough Council followed suit with a similar measure.